Summer is just around the corner, so that means schools and daycares will be released for a few months. What is probably the most exciting part of the year for children of all ages, can be a stressful time for working parents who need to find a safe and nurturing place for their kids. At Home Away From Home, we want to provide a solution that will make everyone happy. At our Summer Camp, we have a variety of activities that will keep your children active, entertained, and the best part, they can continue learning. Because even though regular school classes may not be in session, learning should never stop. Here’s what you and your kids can look forward to. We’ll make a trip to the Palm Beach Zoo & Conservation Society to learn about a variety of animals that come from faraway countries. Your child will get to watch koala bears, sloths, flamingos, anteaters, snakes, tortoises, and more. Children love getting to see these beautiful animals up close and it’s a great opportunity for them to learn about the wildlife that they wouldn’t normally see in Palm Beach. 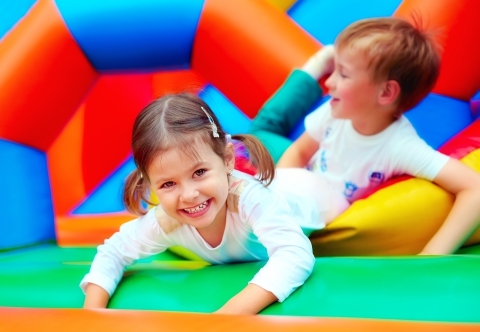 Play happens in a variety of ways, and bounce houses are no exception. Your children will get a chance to jump, bounce, fall, and laugh for hours. Not only is this draining their energy, which you can appreciate when you pick them up after a long day, younger children will have the opportunity to practice motor skills and further develop hand-eye-coordination. Everyone likes a good party, right? And themed parties are especially unique and fun. Let your child truly explore their imagination when they dress up for different themes. When children have strong imaginations, they will be more likely to think outside the box when having to solve problems in the future, they will be more active, and can have stronger decision-making skills. All of that from a party? Yes! Our water activities offer another method of playing, and it’s a great way to cool off from the heat of Florida’s summers. This time gives your son or daughter a break from studying at our daycare and lets them truly let loose. 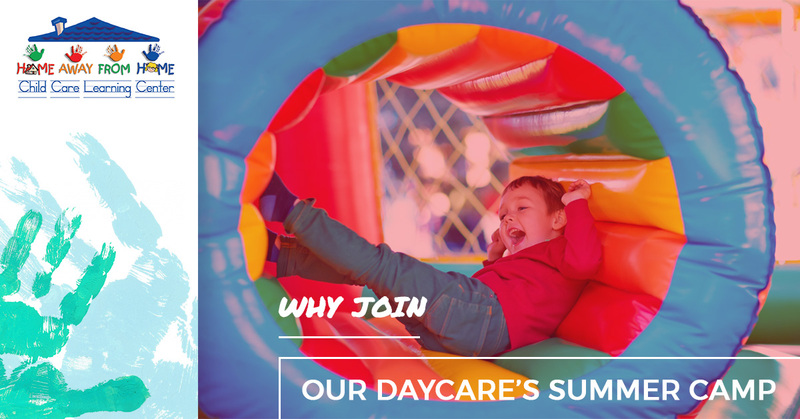 As you can see, play is an important part of your child’s time at our daycare, and what’s better than that during their summer off? Playing on the playground allows them to build necessary muscle, continue practicing and improving motor skills, and they can build strong relationships with the other students. 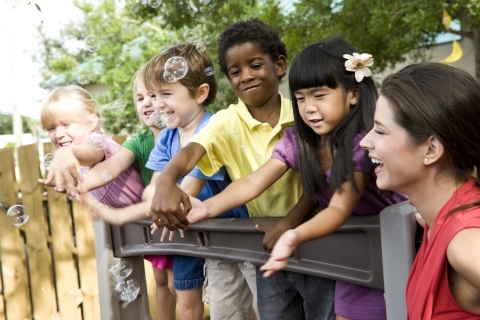 An important part of any child care program is to give children a chance to interact with others. As children interact with each other, they are learning basic social and interpersonal skills that are so important for their future. Each daycare location will make several trips to local parks and go on nature walks. At the zoo, they’ll learn about different animals that aren’t a part of the Florida ecosystem, but during our nature walks, they will get to know the animals that live in their own backyard! During these trips, we’ll make sure that everyone is learning by asking them questions about what they see and even hear! What child doesn’t love getting messy in the kitchen? Especially when it means they get to have a tasty treat in the end! Cooking gives children a chance to practice basic math problems, the chemistry of cooking and baking, and also teamwork! These skills will be incredibly beneficial as they continue learning about the world around them. At Home Away From Home, our teachers are passionate about helping children learn and grow in any way possible. From playing on the swingset, to learning the names of different animals, to cooking up a storm in the kitchen, it’s easy to learn and have fun at our summer camp. Please get in touch with us today if you have any questions about our summer program and to enroll your child at our daycare.